While Thanksgiving isn’t officially celebrated in the UK, it has gained a bit of momentum in recent years with a number of restaurants serving Thanksgiving dinner and an increasing number of festivals, including the Harvest Festival where Brits give thanks for food and the year’s harvest. 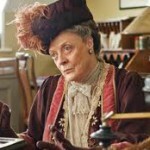 Downton Abbey is no exception when it comes to multi course formal dinners, served with a claret, of course. Should Cora’s mother Martha and/or crazy brother Harold blow into town and arrive unannounced at Downton for the holidays, I have to believe that a quickly pulled together Thanksgiving celebration effort by Mrs. Patmore would be nothing short of simple given the monumental nightly kitchen duties in preparing meals for the Dowager Countess and family on a daily basis. Thanksgiving or not, the Granthams do know how to party as long as a gong is within earshot. And, I suspect, once she stops mistaking Robert for a waiter, the Dowager Countess really does know that a weekend is for entertaining. Whether it’s a surprise birthday celebration for Robert complete with a jazz band, a ‘simple’ Downton house party featuring a performance by Dame Nellie Melba, or just welcoming Mr. Bates home from prison, no one can entertain like the Granthams. But all this entertaining does come with a little dinner drama, I’m afraid. For the sake of PBS audiences in America, we won’t even mention the unmentionable drama that plays out at the dinner table during the forthcoming final series….UK fans, you know what I’m talking about. 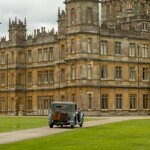 For me, aside from family and friends, today is a pretty good day to be ‘thankful’ for Downton Abbey. You?